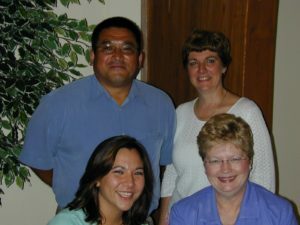 Janita Beall (bottom right) is a Seeds for Tomorrow member. Mr. Beall taught government, a class required by all students at the school, but he always taught above and beyond the required curriculum. Mr. Beall understood that his students would eventually leave Maconaquah and one day lead the country, and he made sure that every student had the necessary skills to do so. He knew his subject so well that students were often astounded how little they used the textbook in his class—the students could read the information in the textbook, but he wanted to teach them how to apply that information. Sadly, David passed away in November of 2005 due to complications after a heart attack. His wife, Janita, created the David W. Beall Memorial Scholarship Fund in his honor. ]Janita continued to leave a legacy in her community by including the Community Foundation in her will, becoming a Seeds for Tomorrow member. The Seeds for Tomorrow Society is the Community Foundation’s way of honoring the extraordinary generosity of donors who have left all or a portion of their assets to the Community Foundation. By entrusting gifts to the Community Foundation, donors can ensure that their contributions will be used wisely to address the future needs of their community, and that their personal legacies will extend far beyond their lifetime.